Despite the business of life and particularly this season, one of my hands down favorite Christmas activities is baking. Creating delicious treats in the kitchen together is something that always brings our family together. I think it’s important to not just make DELICIOUS foods on holidays, but to make them with MEANINGFUL recipes. The kind that evoke memories of special people and special times–or that make you feel connected to whom and where you came from. For our family, that means the Lawrence family’s ubiquitous Chocolate Crinkles and Snickerdoodles. Muddy Buddy’s a la Auntie Deanna. Grandma Magner’s Nuts ‘n Bolts. And for Christmas dinner, Great-great Aunt Ethel’s Cranberry Christmas pudding (simmered on the stove top in a coffee can to be especially authentic and true to its roots)—with caramel sauce. Num! Family traditions are important. Family is important, period. Whom and where you came from is an important part of who you are, whether you like it (or them) or not. It keeps you connected to the bigger picture in life. Whipped Shortbread: 1 c soft butter, 1-3/4 c flour, 1/2 c icing sugar, maraschino cherries. Cream butter thoroughly. Combine and add dry ingredients at low speed on blender. 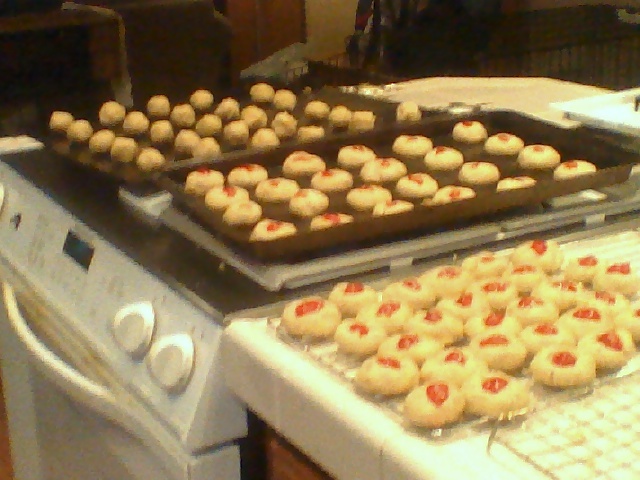 Roll in small balls, press in a piece of maraschino to the top of each. Bake @ 325 for 13 minutes. This shortbread recipe has been in my family since who knows when and is my earliest memory of a FAVORITE Christmas cookie. Unfortunately the dough is as good as the cookies so it’s always debatable how much dough is actually going to make it to cookie form!